Christian, Jewish, and Muslim voices weigh in on an important and timely topic. Since 1989, the Kaufman Interfaith Institute has been working to promote understanding and respect among different faith groups in West Michigan. Their Triennial Dialogue happens every three years and serves as an eye-opening conversation that addresses current issues that society faces through different religious points of view. The theme of the 2018 Triennial Dialogue is “Religious Identities: Uniting or Dividing?” Kyle Kooyers, the program manager of the Kaufman Interfaith Institute, stated that this conference will “…focus on whether or not those identities lead towards unification and cooperation or whether they lead toward division or and disunity and how that might be taking place and why.” The conference will be an excellent opportunity to gain a further understanding of the Christian, Jewish, and Muslim faith perspectives and how and if they can work together to make positive changes in our society. The event will take place over the course of two days, consisting of a pre-conference and a main conference. The pre-conference will take place on November 14 in the Grand River Room of the Kirkhof Center on GVSU’s Allendale Campus. Each speaker will give a 10-15 minute presentation, which will be followed by 45 minutes of discussion and Q&A from the audience. This portion of the event is designed to be more convenient to college students who may have busy daytime schedules and may not have time to attend the main conference in downtown Grand Rapids. The pre-conference will allow people to hear from each speaker as well as have a chance to interact with them. The main conference will be held on November 15 at the Eberhard Center on GVSU’s downtown campus. This portion of the event will be a more formal and in-depth version of the pre-conference. Each speaker will deliver longer speeches followed by a response from the other two speakers. Since they will be hearing from each speaker during each of the three sections, the audience will be able to develop a better understand for each of these viewpoints and learn how to relate to them rather than to fear them. The conference started as a Jewish/Christian dialogue but has since expanded to include views from the Muslim faith, as well. 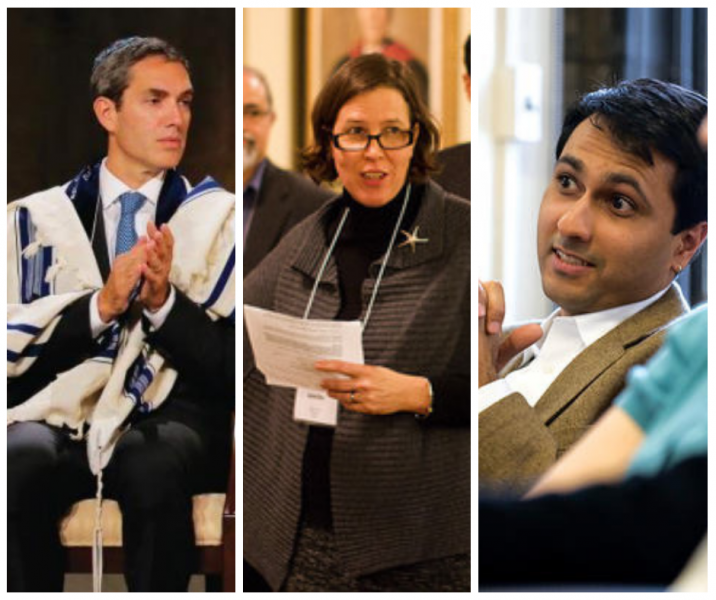 The speakers this year include Rabbi Elliot J. Cosgrove, Jennifer Howe Peace, and Eboo Patel. Elliot J. Cosgrove will be the Jewish voice at this event and is the Rabbi at the largest Conservative Synagogue in New York City. Cosgrove joined Pope Francis on the ten-year anniversary of 9/11 to do an interfaith commemoration of the tragic events that took place on that day. Eboo Patel will be the Muslim voice in the conversation and is the president and founder of the Interfaith Youth Core. He is the author of several books and is involved in revolutionizing the interfaith conversation on college campuses both nationally and internationally. He has worked with the interfaith institute at GVSU in the past. Jennifer Howe Peace will share the Christian point of view at the conference. She is one of the first professors of interfaith work and teaches at the Andover Newton Theological Seminary. Peace has also partnered before with the Kaufman Interfaith Group and has partnered previously with Eboo Patel on interfaith work. The event is free for everyone, but audience members still need to RSVP for the pre-conference and the main conference.